Stony Brook, ranked nationally at No. 1, showed off its skill in an 18-5 win over the Binghamton women’s lacrosse team on Saturday. The Bearcats (5-7, 2-2 America East) entered the match on Saturday coming off of a notable victory against UMBC. 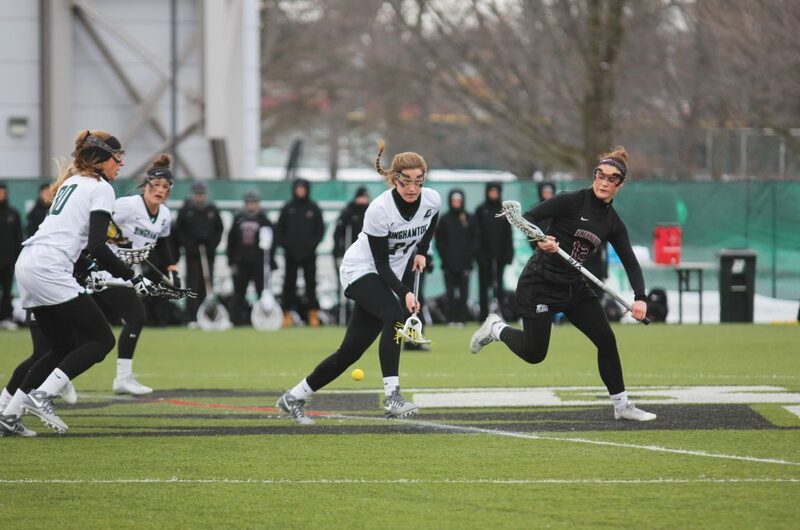 The game against UMBC was a recording-breaking day for senior midfielder Jacqueline Kennedy, who produced an impressive seven caused turnovers, breaking Allie Rodgers’ and Beth Moore’s single-game caused turnover record previously set at six. Kennedy swooped up nine ground balls, tying with Lauren Wetherell and Lauren Gabbamonte for most ground balls in a single game. Kennedy did not stop at two records, additionally breaking Rodgers’ season record of 37 caused turnovers. Kennedy now has 38 caused turnovers to her name and is on her way to overtaking the career record of 74 caused turnovers set by Rodgers. Although Kennedy had a record-breaking day in the game against UMBC (9-5, 1-3 AE), the match against No. 1 Stony Brook (12-0, 4-0 AE) proved to be much more difficult, and Kennedy was only able to sneak in one caused turnover. She scored Binghamton’s first goal in the second half of the game. While the first half of the game produced no results for the Bearcats, it was smooth sailing for the Seawolves, who netted 12 goals, ending the half 12-0. Senior attack Kylie Ohlmiller and redshirt senior attack Courtney Murphy, who has the most career goals in NCAA Division I history (296), led the Seawolves in the first period, with each player netting three goals. Even though the Seawolves scored 12 goals, BU sophomore goalkeeper Taylor Passuello displayed impressive play between the pipes, saving a total of eight shots. Even though the Bearcats were shut out in the first half, the team livened up in the second half and had some back-and-forth goals with Stony Brook. Kennedy was the first to help Binghamton find its rhythm. Redshirt senior attack Brianne Arthur was next on the scene, but not before Stony Brook netted two of its own goals. Arthur, who currently leads the team in scoring, fired back and netted two of her own, clocking her 25th and 26th goals of the season. Freshman midfielder Alyssa Sanchez was next to put her name on the board, posting Binghamton’s fourth score of the day and her second of the season. Stony Brook was then able to sneak in another goal before junior midfielder Rebecca Golderman was able to find the back of the net. The Seawolves then went on to log three goals to secure their win, 18-5, demonstrating why they are ranked first in the country. “When we had a good stop on the defense end, we were able to capitalize on that in the second half on the offensive end,” Allen said. The Bearcats are set to take on Hartford in an away game on Saturday, with opening faceoff scheduled for 1 p.m.